A delicious, healthy and gluten free take on Asian Classic - Bánh mì. 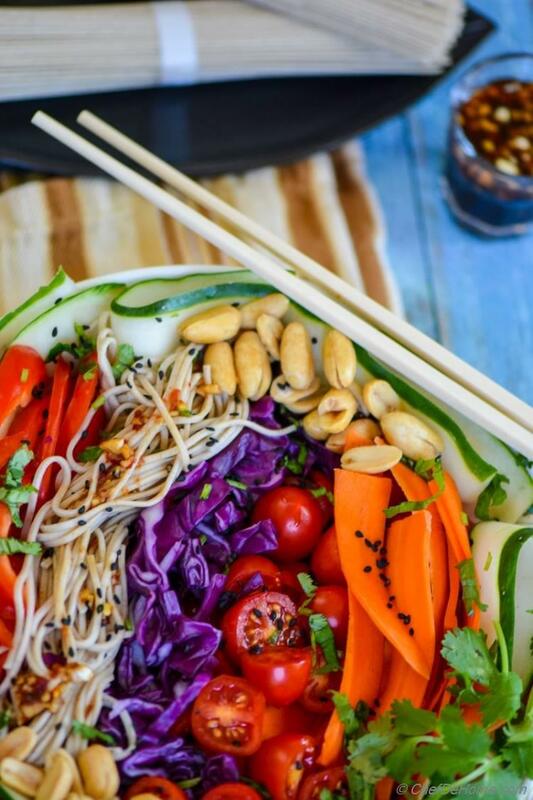 This salad is loaded with fresh crunchy vegetables, lite and gluten free Buckwheat Soba Noodle with Sweet and Spicy Chili-Garlic Dressing! I call it: an Asian Bánh mì experience in a delightful summer salad bowl! I'm telling you, this salad will change the way you look at traditional Bánh mì sandwich! By the way, before we dig deeper into this salad. Let me ask you, how was your long weekend?! Had good time? Stayed at home, partied, made good food?? Me??? I did nothing..... honestly, took a GOOD LONG break from blog, watched TV, made good food..... and, and, and, ...... I think... nothing else. :) As much as I missed blogging and socializing, I loved sometime away from work..... Good for a change! Isn't it? For those who are new to word, Bánh mì. It is a Vietnamese term for all kinds of breads. And "one thing" my Banh Mi Salad does not have is "the bread". Oh boy! What was I thinking!! A Bánh mì sandwich, which you often order in Asian (Vietnamese) Eateries, is a meat and vegetables filled crusty bread sandwich dressed often in delicious chili-garlic dressing. This bowl of salad offers all those scrumptious flavors in a gluten-free vegetarian salad. Vegetarian Bánh mì is clearly..... a humble attempt to provide a 'Bánh mì sandwich' experience to all my vegetarian, and gluten free friends! I mean... really... when these days, smoothies can be a healthier version of "Apple Pie" or 'Strawberry Shortcake', why can't we have a healthy version of classic favorites? Plus it is so fit to enjoy 'Summers in a Salad Bowl'! 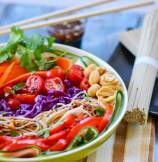 One key ingredients in this Noodle Salad is "Buckwheat Soba Noodles". I had delicious introduction to buckwheat noodles, last year, in an Asian Eatery in San Francisco. Since then, I never stopped using'em in salads, even soups and stews! Buckwheat Soba Noodles are gluten free, lite in taste, ready in just 4-5 minutes, and have amazing texture! they just have enough bite to call dish a Pasta dish, yet much much liter than regular wheat or semolina pasta. Even though I'm not gluten free, these noodles has made me (even more) fan of buckwheat. If you have never tried it, I highly recommend trying some. You will be glad to include it in your diet. (and this is not a paid advertisement). 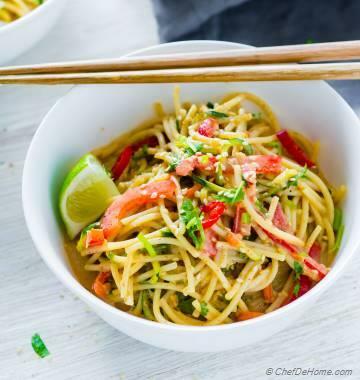 AND I'm giving you this delicious recipe to try it! Another delicious component in this salad is: Chili-Garlic Dressing! 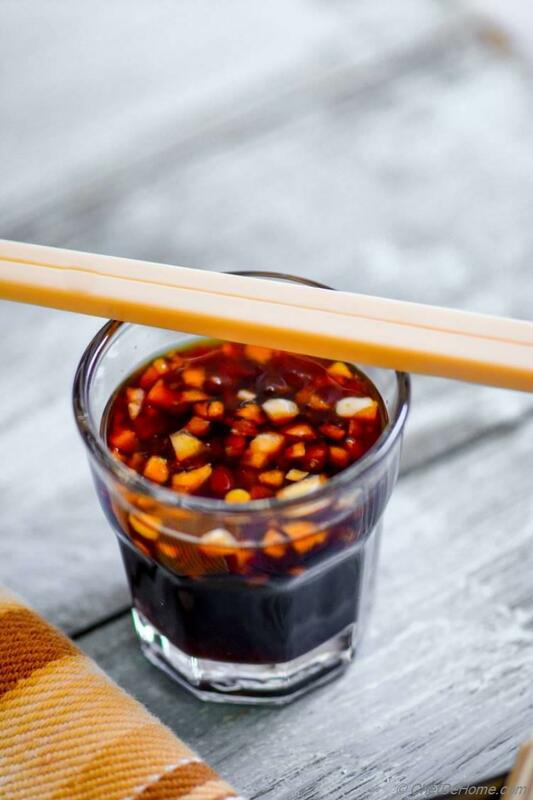 Garlic, soy sauce, chili paste, and vinegar..... few of basic Asian ingredients make magical and killer delicious salad dressing. Not just pasta or salads, I even use leftover Chili Garlic Dressing in marinades! It is Gluten Free and can also be made Vegan. To keep the salad complete gluten free, I have used "gluten free" Tamari Soy Sauce. You can find it in Asian or International Products Isle of most Food Stores. If you are not looking for complete gluten free salad, feel free to use regular soy sauce. Just start with less and then adjust per taste. Only non-vegan ingredient in this salad is "Sambal Chili Paste". 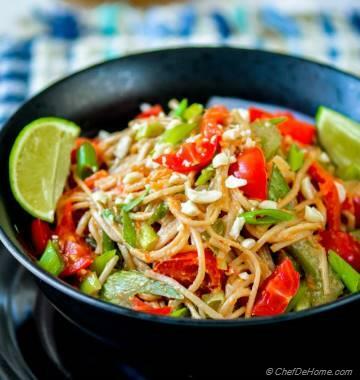 Use a vegan chili garlic paste or 1/4 tsp of fresh Thai chili flakes instead for a "vegan" salad. Friends, all of you who never tasted famous "Banh Mi" just because it only sold as "sandwich" and you don't like carbs or can't eat gluten. Or if your local Vietnamese Eatery does not sell a "vegetarian" Banh Mi ...... your wait is over!! This salad will make you taste, your kind of Banh Mi, in comfort of your own home! How good does that sound? Even if you love Meat Banh Mi Sandwich and have no problem with gluten...... 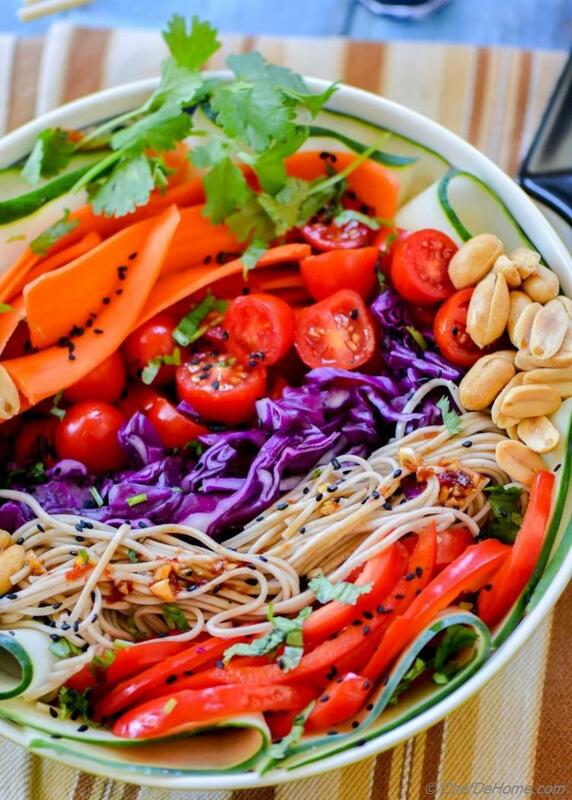 I'm sure beautiful colors of this salad, with lite soba noodles and sweet 'n' spicy garlic dressing is perfect for summers! 1. Ready in just 15 minutes, this Salad will fly from Kitchen to Dinner Table! 2. This hearty salad is loaded with veggies and flavors to beat any Pasta Dinner your family can't live without! 3. Salad is vegetarian, and can be made vegan. 4. Defying it's own name, Banh Mi salad is gluten free and thereby much low in carbs than classic Banh Mi Sandwiches. 5. Make Ahead! To pack for lunch or for dinner party, you can prep all components of this salad a day advance. Make dressing, cut veggies and refrigerate. Cook noodles, assemble and serve! Trust me friends, this salad is delicious colors of summer in a "bowl"! A must try!! 1. To make dressing, in a small bowl, add minced garlic, honey, tamari, sesame oil, chili paste, red pepper flakes, and rice vinegar. Whisk to blend oil with honey and vinegar. Taste and adjust seasoning. Set aside. 2. Cook soba noodles per package direction. For buckwheat soba noodles, I bring a pot of water to rolling boil. Cook buckwheat soba noodles for 4 minutes. Drain water and then rinse under cold water. 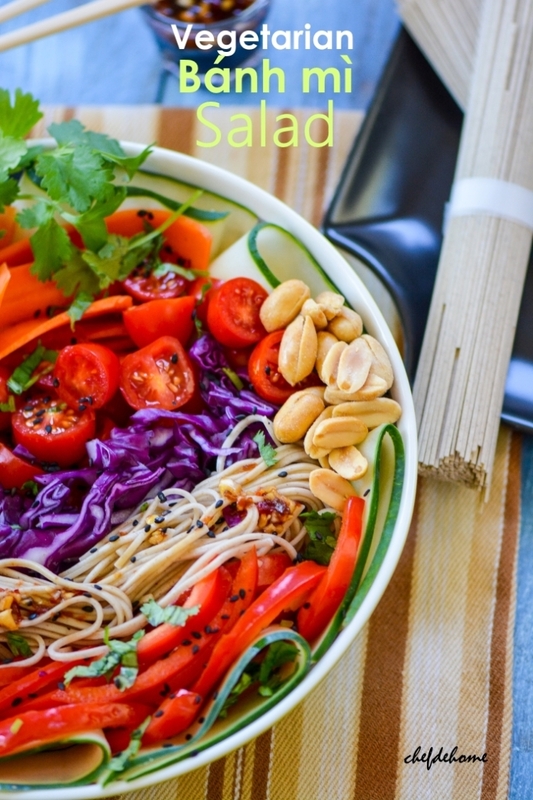 Add soba noodles to a salad bowl and add 1/2 of dressing. Toss well with hands and set aside. 3. Slice all veggies. 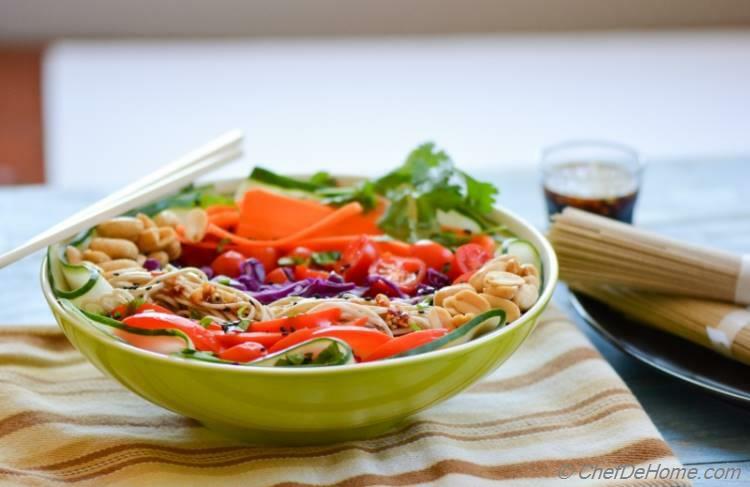 If serving in a wide salad bowl, mix all veggies into the dressed noodles. Toss to combine. Top with toasted peanuts, sesame seeds, remaining dressing and few cilantro leaves. Or Plate salad in separate layers in individual salad bowls dividing noodles and veggies equally among 4 plates. Top with toasted peanuts, cilantro leaves, sesame seeds and remaining dressing. Serve and enjoy!! Anu, thanks! You know even though I felt weekend to end soon, I actually enjoyed it :) and high-five. for the pin. girl!!! This salad looks so tasty and colorful! Never had banh mi salad, but I'm pinning to try it! Mira, thanks my friend!! Banh mi is a Sandwich, salad is my gluten free and healthy interpretation of the same! These days I am also trying salad recipes and now I found a new one to try. Bookmarked it. Colors are looking so beautiful. 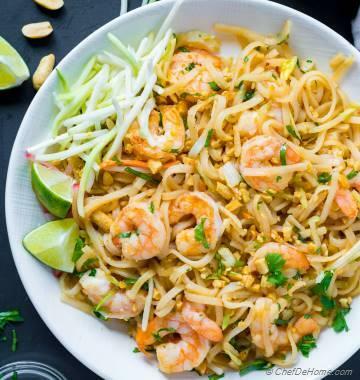 Amazing recipe!! Rachna, you must try this! This is salad is a dream-come-true for salad lovers plus very easy to make! This looks incredible. I am loving adding some peanuts on to a salad. It adds lots of delicious crunch. Agree! Peanuts provide a much needed crunch to a salad! Olivia, thanks! I'm glad you like this salad. Try Banh Mi sometime, if you like Asian food, I'm sure you will love the taste. I pretty much did the same! Glad you had a relaxing weekend Savita, we all need that! :) The saiad looks gorgeous and so colorful, love it! I agree, we all need to relax a bit :) thanks dear! Glad you like the salad!